Founded in 1865 by Jean Roullet (who marked his doll & mechanical toys wind up key JR), in 1879 Jean's only daughter Henriette Roullet married Ernst Decamps, a worker in his company. In 1889 the partnership was formed between of Roullet et Decamps, by 1906 Ernst Decamps became head of their firm. Jean Roullet passed away in 1907. After Ernst also passed away, his widow Henriette Roullet Decamps and son Gaston Decamps were the successors. 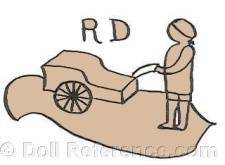 Roullet & Decamps is best known for their automata, mechanical walking and moving dolls and toys who are marked on the wind up key RD. Roullet et Decamps won many bronze, silver and Grand awards between 1867 and 1910. Roullet et Decamps used marked bisque heads made by Jumeau,, Kestner and Simon & Halbig and possibly by other porcelain doll makers French or German. 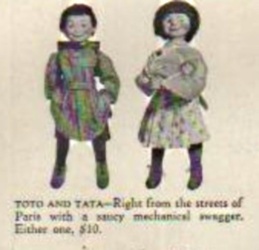 1939 Toto and Tata - right from the streets of Paris with a saucy mechanical swagger. Either one $10. 1914+ Toto doll and Tata dolls 14 1/2" tall, composition heads, painted faces, closed mouth grinning faces, cardboard spring wire body, composition or bisque hands, wooden legs and feet, mechanical key wound walking dolls, key marked RD. Designed by Gaston Decamps, Toto and Tata dolls were sold in the USA by Abercrombie & Fitch of New York.